Shipping $10.04 Add item to cart for shipping estimate. You can SAVE on shipping by buying multiple items from the same seller. Shipping is charged by each individual seller. Sellers at times may also provide FREE SHIPPING on select items or on entire order if it meets the minimum order value. Please check sellers page for more details. This thali is made from durable premium quality steel. It is great for serving snacks and appetizer. Stainless steel thali / plate is a very common utensil that can be found in every Indian family. Usually thalis are used with katoris (bowls). This 2 compartment thali can easily replace those bowls. Use it for dishes such as dosa, rice, dal, vegetables, chapati, papad, curd (yoghurt), sambar, small amounts of chutney, pickle or a sweet dish. Ideal for serving lunch platter at restaurants or dinner at home. Features: Round tapered edges and can easily stack. *Price is for 6 plates. Shipping Cost $10.04 Buy multiple items online from Sangu Enterprise Ltd to SAVE on shipping. This item in Utensils from India category was first added to our catalog on 10-02-2017. Buy Stainless Steel Rectangle Plate / Thali w/ 2 Compartments (6 Pcs), sold & shipped by Sangu Enterprise Ltd where you can shop online for Indian Restaurant Supply, Pooja Mandir, Handicrafts, Utensils & Gifts. 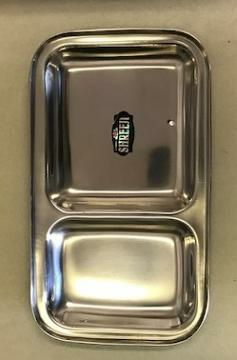 This Utensils collection has been tagged as Stainless Steel Serving Plate Sale, Banquet Restaurant Supply, South Indian Dinner Set, Tiffin Bartan, Ss Thali, Kitchen Utensils. Stainless Steel Rectangle Dosa Thali / Saravana Plate 5 Compartments 16.5"
Premium Quality Stainless Steel Dinner Plate / Saravana Dosa Thali 16"